Mcdonalds is rewarding their My McD's Mobile App users with a freebie! Get a Free Big Mac or 6 Piece Nuggets for Free! Offer excludes any meals, pairings, or other offers. 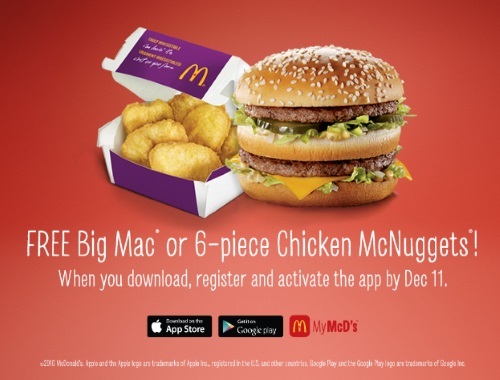 To redeem just present the offer on your Mobile app at participating McDonalds restaurants. Offer is valid until December 18, 2016 at 11:59pm ET. Please check if your location has this participating offer before heading out! You need to be subscribed and logged into the App to see the participating offers. I had a bunch of other coupons in addition to this one including $1.50 off breakfast, $2.50 off Extra Value Meal and BOGO McFlurry. Click here to get the Mcdonalds Mobile App.